John Oswald was born in 1970 and raised in southwest Philadelphia. The city’s graffiti streets became his inspiration catalyst . Known as “Semet one” in Philadelphia and around the world, he developed a love affair with graffiti that continues to be seen in his work. John is proud to present his version of Philly graffiti art with cubism in abstract forms. It is John’s belief that cubist forms and graffiti share many similarities. Seeking new combinations on busy worked surfaces, he uses spray paint, charcoal and acrylics to create objects and letter forms in a conceptual approach. 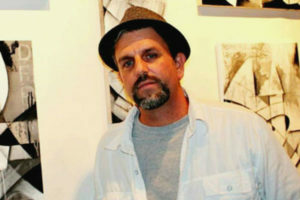 John’s art includes works of realism, cubism, ocean art, abstract and graffiti in various mediums. John studied under artist Diane Burko at Philadelphia Community College and continued his studies at Tyler School of Art with a focus on design. Semet one’s early work can be found on the graffiti website, www.artcrimes.com. Follow John on Instagram at: semet1dfr.